Beck and MGMT apparently will be sharing a studio/stage for a radio broadcast in Chicago, the afternoon before their tour show. Tickets given away via the radio station. All members of both bands, I think about 11 in total played. Everything was stripped down, all acoustic guitars, stand-up basses, banjo's, melodicas, obviously a few keyboards for different songs and kazoos. 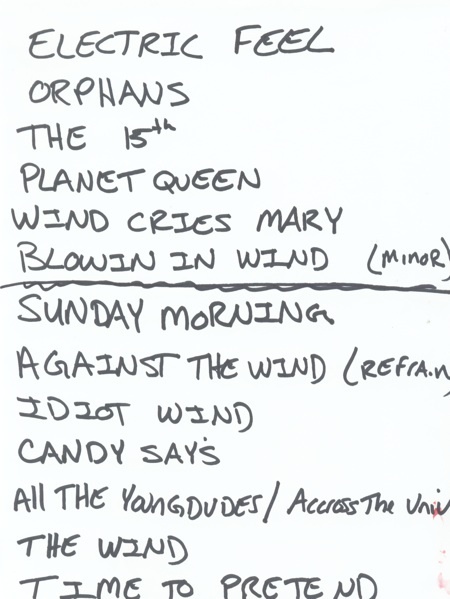 I have attached a copy of the set list but it should be noted the final song, which beck referred to as "the big payoff", was "All the young dudes" into "across the universe" into a little of "dear prudence" into "the wind" and then finally into "time to pretend" acoustic with banjo's and a melodica doing the keyboard riff. I believe the theme of the night was wind due to the windy city. The cover of blowin in the wind was also played very slow, and almost Johnny cash/tom waits/delta funeral march style, very amazing. After the final song, they didn't know what else to play so there was a little bit of free form which included another one bites the dust and others. Finally Beck and MGMT said they had to go because they had to play the actual show at the Aragon at 7:30. I'm still dying to hear a recording of this whole set. Is it out there somewhere?! It was recorded for a "future broadcast," but I have no idea if that ever happened or not. Who works at WXRT?